Created in 1965, the WRC (then called the Windham Regional Planning Commission) was Vermont’s first regional planning commission. People in seventeen Windham County towns understood that there was a growing list of complex, technical issues that exceeded the expertise and experience of the layperson volunteers who make up our selectboards, planning commissions and other town governing bodies. Today, the WRC provides service to 27 towns in Windham, Windsor and Bennington Counties. Windham Regional Commission’s history is the history of the Region since the 60s. We've written a booklet (authored by Greg Brown) and created a series of videos (produced by BCTV) and articles outlining the history of the WRC and the important role we've played in shaping the region, and planning in Vermont. Special thanks to The Windham Foundation for underwriting the booklet "The Windham Regional Commission - Celebrating 50 Years," and video series "50 Years of the Windham Region – 1965-2015." 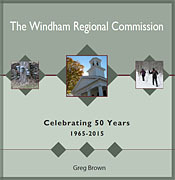 Former WRC staff member has authored "The Windham Regional Commission - Celebrating 50 Years" to tell the history of the WRC. But this document tells more than just the story of organization. The founding and growth of the WRC is rooted in the history of the region itself, from the dramatic cultural and land use changes of the 1960's and 1970's through the challenges of today, and what may lay ahead. It is as much a 50 year history of Southeastern Vermont. 50 Years of Service series looking at the early days of the organization. at the Townshend Town Hall. and Greg Brown talk about the history of Vermont's Act 200 and the role the Commission played its development. headlined by keynote speaker Governor Peter Shumlin.